Pentacon Praktisix, 120 roll film SLR. Photograph gallery. Our Praktisix finally had it's first outing in April 2003 during a return trip to Napoli. Despite the weight the camera is pleasant to use, and I find that there are quite a few occasions when the ability to hold the camera over your head to look into the focus screen gives me valuable extra height. A useful consideration given that I am barely 165cm tall. The Biometar is quite sharp and this one produces images of good contrast. 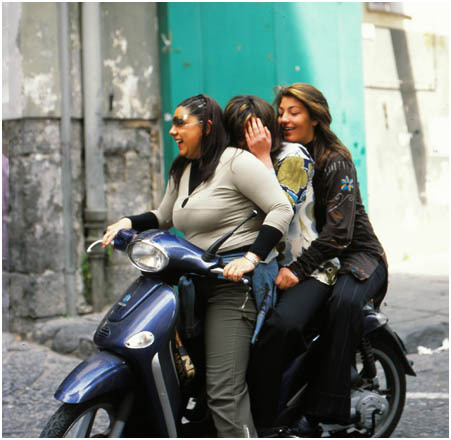 Napoli, Easter 2003. The buildings are distressed and the streets busy with small bikes and scooters, frequently with 3 or more people on board. We spotted up to five...and we have the photographic evidence to prove it, but that picture wasn't with the Praktisix. Another feature of the Praktisix I like (as with some other earlier SLRs) is the mirror remains up at the end of the exposure, this serves as a reminder to wind on. I don't use a prism either and I find this appears to relax people on the receiving end slightly, the reason behind this defeats me but it seems to be so. The large shutter blinds, on the other hand, produce a fair old clap as they gallop across the film plane and thump into their respective stops. It's got character though. 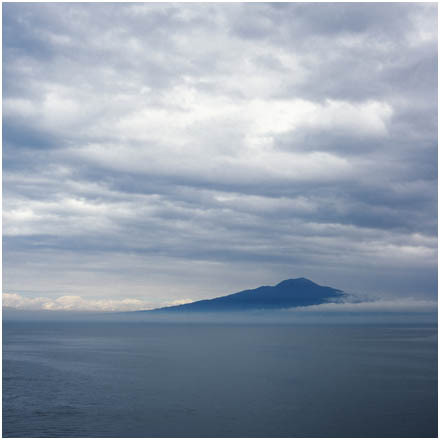 The Island of Capri in the light sea fog and a layer of low stratus just after the rain had stopped. Pompeii was destroyed beneath a pyroclastic flow brought down upon it during the eruption of Vesuvius in A.D.79. The normality of Pompeii is striking, elements of it seem so familiar to us today, streets, pavements, pedestrian areas, public baths, mains water in places, shops and bars. Even some of the shop signage written on the walls survives. The streets always fascinate me, the Romans built crossing points so that pedestrians could keep their feet dry when crossing flooded streets in the rain. Here we see three such stepping stones, crossing a heavily cambered street, to ensure the rain is channeled to the sides. 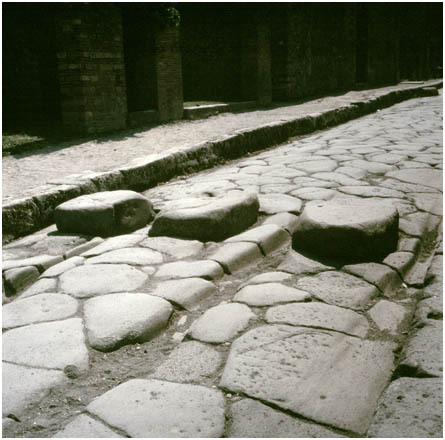 The crossings forced the carts between them which eventually caused not only these ruts from countless cart loads of Roman trade but also complaints as to the state of the streets. Nothing really changes! Looking at these ruts I can imagine the clattering wheels of this bustling Roman town. 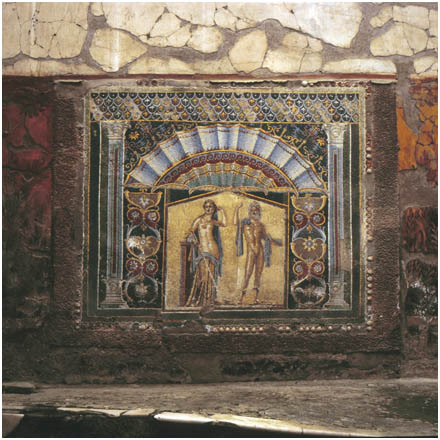 Besides the completeness of Pompeii, it's primary claim to fame are the vast number of decorative paintings and mosaics. Some were considered too important to be left out in the open and were removed to the museum in Napoli, but hundreds remain exactly where they had been painted 2000 years ago. One such painting is this proud chap to be found the "House of the Veti", he is Priapus - not unreasonably, the God of fertility. Although his tale is rather more complex. Priapus is quite high up the wall in fact, the Praktisix having to be used upside down at full reach above my head to get this through a grate. Also to be seen are the wall decorations, the best of these are to be found in the richer households, and there are many to be found. 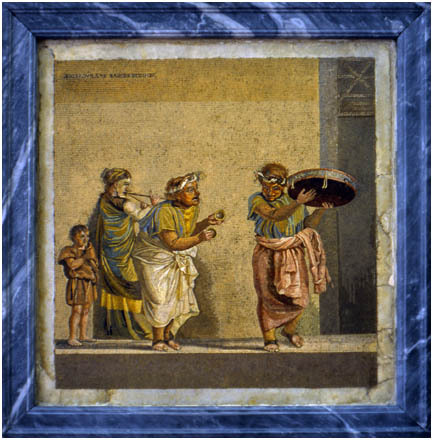 Some of the mosaics are of such extraordinary quality they are now to be found in the Museo Nazionale, Napoli - having been lifted intact from their original sites. This allows you to see them in their original colour as, inevitably, those on site get covered with dust. The quality is quite staggering, especially when you compare it to, say, English art during the later so called dark ages. The original picture was handheld for 1/15th sec, but the weight of the Praktisix damps out vibration effectively, every individual mosaic piece is clearly visible on the transparency. This image has always been a tricky one for me, and for many years it went unpublished. I took it deliberately from the same eye level as this Pompeii victim, seeking cover in the back garden against the back wall with many others. Did he know them? Is this his last look at his family huddled together? The brutal mechanics of burning are that it stiffens the muscles, locking the victim into a pose as they succumb. In this case the hot gases from the pyroclastic flow were hot enough to scorch it's victims into these poses, the lava dust and ash that followed them buried them, and in time the bodies rotted away leaving cavities in what became the mud and earth over Pompeii. 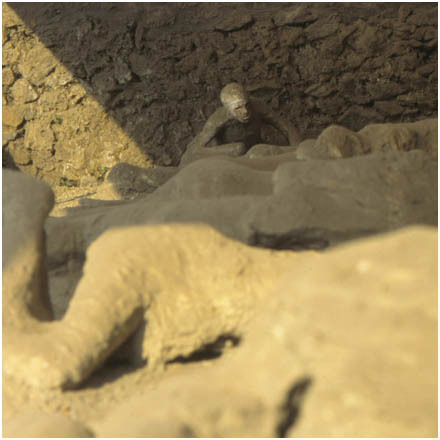 During the excavations someone noticed that there were cavities in the earth in which skeletal remains were often found. So when they next found one instead of digging it up, they poured in plaster which revealed these and many other poignant records. Unlike ritual burials, this is the moment of death. In many respects this event has been recorded mechanically, directly. It's a three dimensional photograph. When I took the image, I expected to be troubled by it, I very much feel like I am intruding on this man's final moments, he alone stays upright to take in the scene. It's almost too personal. 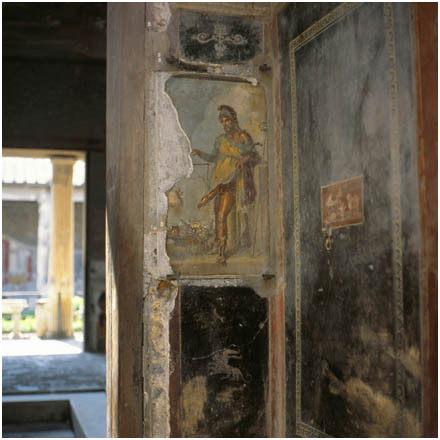 Not far from Pompeii is Herculaneum, or Erculano, similarly destroyed in the Vesuvius eruption of 79AD. A small port town, many of its residents took refuge in storage cellars on the quay side, maybe waiting for boats to take them away. Their remains are there to this day. This site is characterized by the buildings surviving to the first floor in some instances and also some of the organic material survives including charcoalised wood. I feel that Herculaneum is a nicer site than Pompeii, though both are absolute "must dos". Herculaneum is a peaceful, slightly poignant place, reflecting quietly on the thousands who were buried here. This beautiful wall moasaic is to be found in one of Herculaneum's ruined buildings. 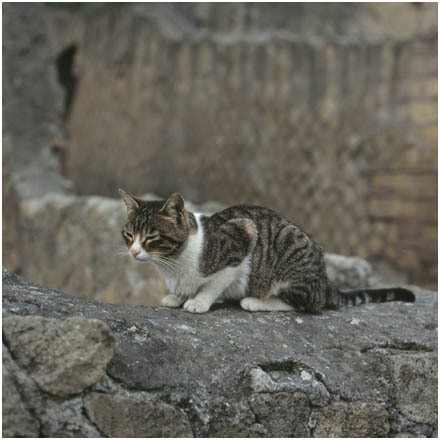 Herculaneum's only inhabitants now are feral cats scratching out a living from lizards and hapless rodents.